The 8" diameter collector meets NWS specifications for statistical accuracy. Every time the bucket tips, a count is transmitted to the indoor display and the gauge empties. You never have to empty the gauge. Each tip of the bucket shows one hundredth of an inch on the indoor LCD display. The display will indicate up to 9.99" of rain. A button on the counter lets you reset to zero after each rainfall. Installation to the plug-in counter is a cinch. 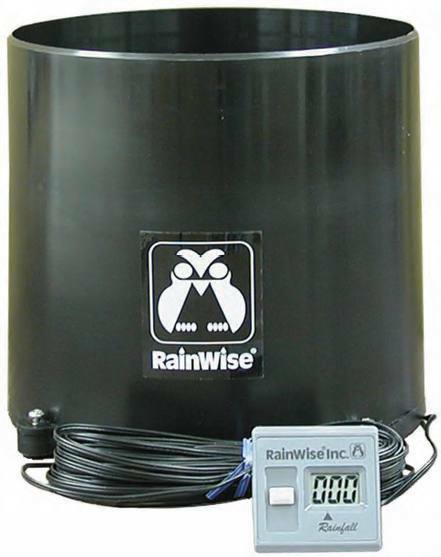 Mount this gauge out in your yard and record rainfall inside the house. The counter is powered by an alkaline button battery # 357. This battery is installed in the counter and should last at least a year.